Cristiano Ronaldo was sent off for the first time in his Real Madrid career after missing a penalty and scoring in a 4-2 win over Almeria at the Bernabeu. 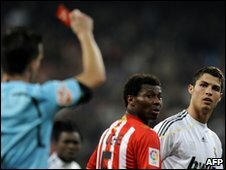 Forward Ronaldo was booked for removing his shirt after scoring Real's fourth goal and saw red for a foul late on. Real Madrid coach Manuel Pellegrini defended Ronaldo, telling Real's official website: "Other players make more fouls and never see a red card." Madrid are five points behind La Liga leaders Barcelona with a game in hand. Pellegrini's side will be without record £80m-signing Ronaldo when they travel to face fourth-placed Valencia next weekend. The Chilean coach accepted the decision to dismiss the former Manchester United winger and deprive him of one of his star men ahead of the important clash at the Mestalla. "It's a shame that he saw a yellow card for taking his shirt off; he should have avoided that," said Pellegrini. "His double booking was fair because he took his shirt off and because he was involved in a series of fouls. "He is nevertheless a creative player who doesn't deserve to be sent off." Ronaldo was contrite after the victory, which left Madrid five points behind La Liga leaders Barcelona having played one game fewer. "I'm human and I made a mistake," Ronaldo said. "I have my flaws too, but I am a professional who doesn't like to miss or lose. "I was sad after missing the penalty and that's why I didn't celebrate the goal that followed. I am a perfectionist, but I'm glad Karim scored. "I was sent off because I reacted instinctively. I wish to apologise for that." Sergio Ramos had given Real a first-half lead on Saturday, but two goals in four minutes gave Almeria a shock 2-1 lead. Gonzalo Higuain levelled, before Karim Benzema restored Real's lead. The French international striker pounced after Almeria goalkeeper Diego Alves had saved Ronaldo's penalty.